Medical Weight Loss Service "That Works"! Losing Belly Fat after 65: What Are My Options? Home exerciseLosing Belly Fat after 65: What Are My Options? One of the things we tell our clients all the time is that you’re never too old to feel good. That’s not just a cliche; it’s 100 percent true! Belly fat is something that stands in the way of feeling good both in terms of your overall health and your self-esteem. It’s one of those problems that affects people young and old, but also one that can be tackled at any age. We recently got asked, “what are my options for losing belly fat after 65?”. What a great question! Many of our patients are above the age of 65 so it wasn’t the first time we had been asked this type of question. Whether you’re 60, 65, or even over 70 years old, it’s not too late to shrink your stomach and boost your confidence. Diet can be a very effective way for seniors to lose belly fat. You might not ever get to have six-pack abs, but you can significantly reduce your weight and improve your health with a good diet and nutrition plan. No matter how many diets and weight loss plans are out there, they all come back to one thing the relationship between calories in and calories out. If your mobility is limited, your diet needs to be modified to match it. In other words, if you can’t exercise like you used to, then you can’t eat like you used to, either. Beyond making sure that your diet matches your physical activity level, you need to make sure that you are getting the right amount of nutrients in your diet. Consult with a doctor or nutritionist before you begin making changes to your eating habits. There are also dietary supplements that may be able to help reduce calories while still getting all the nutrients we need. Ask your doctor or consult a medical weight loss specialist to learn more. Our hormones change as we get older, especially for women. This leads to weight gain and increased belly fat. Even the best diet and exercise plan can’t combat these hormonal changes, which is frustrating when you are trying to lose weight. Seeing a hormone specialist can provide insight into whether or not hormones are a factor in your weight gain. A hormone specialist can also be work with you to create an effective weight loss plan for your specific circumstances. A specialist might recommend medication to even out your hormones, which will lead to weight loss and belly fat reduction. This is an appealing option for seniors, especially when paired with a nutrition plan and an increase in physical activity. Verju Laser System, one of our newest weight loss offerings, is appropriate for people of all ages. It’s a laser treatment that removes fatty lipids from fat cells, causing those cells shrink. As the cells become smaller, they take up less space and your body’s lymphatic system fires up to eliminates unwanted fatty lipids. The fewer fat cells your body has, the less you weigh and the better your belly and body looks. Verju, is also effective for reshaping your body and reducing the appearance of stubborn cellulite. While not directly related to belly fat, it’s never too late to get rid of problem areas and feel comfortable in your own skin. This is one option that’s not viable for losing weight after age 65 in most cases. The risks are just too great to justify the risk after a certain point in life. Liposuction and tummy tuck surgery are considered invasive procedures? which usually become more complicated with age. 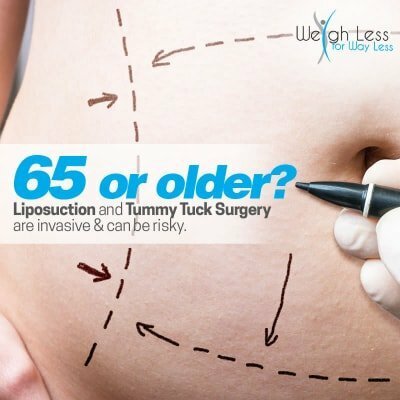 Tummy tucks, in particular, involve general anesthesia, incision and scarring, and long recovery periods conditions that may be too risky for anyone considered elderly. These procedures are also expensive and not likely to be covered by insurance unless there’s extreme health need. If you are retired and on a fixed income, you should not have to spend your money on costly surgeries when there are plenty of other options available to you. As you may have already experienced, the older someone is, the more challenging it becomes to lose weight and fat, especially around the belly. Likewise, treatment options are reduced due to risk factors associated with age. The best solution An individualized program that is tailored to your goals, your body, and your lifestyle. 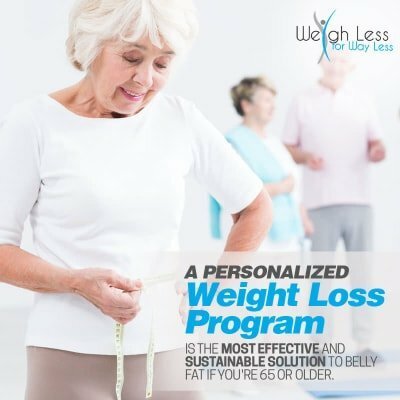 With the many factors to consider when it comes to losing belly fat after 65, it is important that each senior receives a unique weight loss plan. Your plan could include diet, exercise, medication, stress management, and other solutions. It will also account for your age, your current health, and your level of mobility. At Weigh Less for Way Less, we specialize in creating these custom weight loss plans. Our doctors and team work hand-in-hand with you, regardless of age, to achieve your weight loss goals. 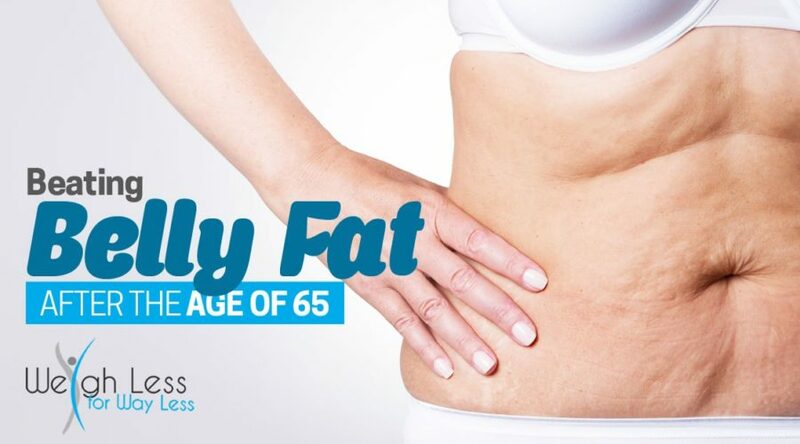 Contact us today to learn more about how we can help you lose belly fat no matter what your age. We have offices in the suburbs of Chicago, including; Elmhurst, Oak Lawn, and Burr Ridge! Have questions about Losing Belly Fat After 65? Call us today to discuss your goals and options! This website is for informational purposes only. Always consult a physician regarding your health before starting any health or diet program. Results may vary.